My calls aren't being recorded. What's the issue? Double-check that you are logged in to www.berniepb.com (check the top bar). 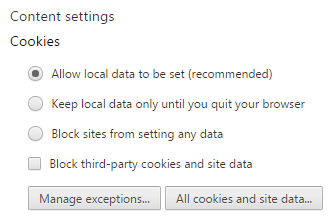 On Firefox, go to Preferences -> Privacy and make sure that similar settings are chosen for website cookies. If you have uBlock Origin or a similar extension (that blocks sites from "calling home" to their home server), you should disable it for Bernie PB. If your call tally in the blue extension popup isn't updating, try closing it and reopening it. If problems still persist, try e-mailing the developers (see the "Contact" section) and mention which service you're using (LiveVox, HubDialer, OpenVPB), what issue you're facing, and how long it's been affecting you (recently, since you signed up, etc). Do I make calls on this website? Bernie PB is not used for making calls or saving responses to phone banking calls. You should head over to the campaign's phone banking hub to learn how to make calls from the comfort of your own home. This website simply makes it easier to track the number of calls you've made, and has many features that intend to gamify phone banking and make it even more fun! Why aren't my calls showing up on the live map? If you're not living in any of the regions that show up on the live call map, your calls will not show up on that map. Also, if you did not provide a valid ZIP code on signup (e.g. you entered 00001), your calls will not show up (the ZIP code 00000 is interpreted as "international"). Lastly, on some services like HubDialer, we often cannot see where your calls are actually going, based on what's made visible to us. My confirmation email expired. What do I do? If the activation link sent to your email address has expired, e-mail one of the developers (see the "Contact" section), and ask them to manually activate your account. Does this site cover all calls being made by all Bernie volunteers? No, it does not. We're only covering the calls made by users who are logged into our site and have our extension installed while phone banking. If you know volunteers who might be interested in gamifying phone banking or tracking their call numbers, though, you should definitely recommend Bernie PB to them! We have a private GitHub repo. It's been kept private so that the extension-related code cannot be abused to increase your call numbers unfairly. Unfortunately, this is a flaw of using a browser extension to tally calls. However, since the campaign doesn't have a public stream of the calls being made (and who made them), the extension is the only option we have. If you're interested in contributing to our repo, email one of the developers and we'll get in touch! No. We are very careful to not expose personally identifiable information (e-mails, your ZIP code) to anyone. We don't plan on making a profit off of this site's usage or your data. Will you make a version of this site for other candidates? We are considering this. We might just put them all under the umbrella of Bernie PB (since they would probably be progressive candidates that agree with Bernie), or we might create a separate website for them. It's up in the air at the moment.